The Royals are headed to the ALDS. Tell me what the headline should be here. I have no idea how to communicate such an insane experience. The night was an emotionally draining blur and this morning my voice sounds like Frogman from Little Rascals. It is with zero hesitation that I label last night’s 9-8 come-from-behind 12th-inning walkoff Royals Wild Card victory the greatest game I have ever attended. People will tell you that they never had a doubt, and that they knew the whole time the Royals had it in the bag. Those individuals should not be trusted. Save for a few strong innings when then Royals held a 3-2 lead, there was absolutely every reason to doubt before and throughout last night’s wild card playoff game. I spent the entire day worrying. I’ve never been so nervous in my life. I posted to Twitter yesterday afternoon that I was more nervous about the game than I ever was proposing to my wife. I joked that I was bringing an extra pair of pants to the game too…just in case. That was a lie, obviously. And I’d also be lying if I said I never had doubt. And if you tell me you never had doubts when we were down 7-3 in the 8th, i question your grasp of reality. Let’s begin with the end. Oakland had just taken the lead, 8-7 in the 12th. In the bottom half with 1 out, Eric Hosmer – who went 3-4 with 2 walks – lifted a ball to deep right. Sam Fuld and Jonny Gomes both looked like they might have a play on it against the wall. Instead, they collided in midair and the ball caromed off the wall for a standup triple. Christian Colon chopped a swinging bunt single and Hosmer scored from third to tie the game at 8-8. 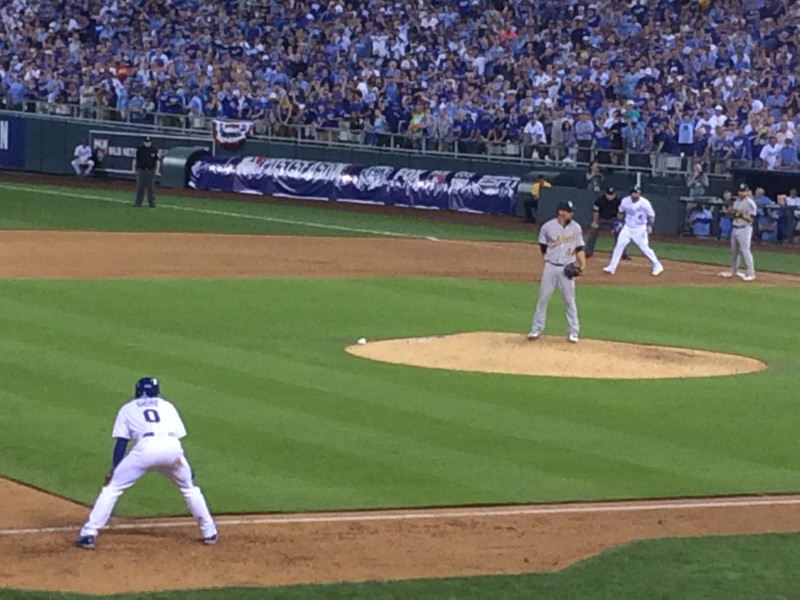 Colon stole second, and Salvador Perez came to the plate. Again, zero reason to be confident here. Salvy had already come up twice with runners aboard and had failed badly. He continues to chase terrible pitches low and away. Throw him a slider down and out, and he’ll swing every time. For a guy who spends every day framing the strikezone he sure doesn’t seem to have a clue where it is. In the 8th inning, with the tying run on third base, Salvy had struck out on a pitch that wasn’t anywhere close. He looked awful. Right on cue, he swung at a pitch a foot off the plate outside, and somehow that ball found it’s way between third base and Josh Donaldson’s diving glove. Colon scored from second, and the game was over. And with that swing the Royals won their first playoff game since winning it all in 1985. The game took 4 hours and 45 minutes, and I’m certain I experienced every emotion possible in that span. It was electric at the beginning and the end. But there were quite a few spots in between that were very very dismal. The place was silent in the first after Brandon Moss hit a 2-run homer to make it 2-0 Oakland early, but sprang back to life when the Royals immediately responded with a run of their own when Billy Butler singled in Nori Aoki in the first. Then went back to bananas when my boy Lorenzo Cain doubled scoring Mike Moustakas and Hosmer singled scoring Cain. If there was ever a point to “not have any doubts” this was it. The fans were all up in Jon Lester’s dome. The whole place was chanting, “Leeeeees-ter, Leeeeees-terrr,” and the A’s starter actually looked rattled. Going into the last night, Lester had owned the Royals over his career (1.84 ERA, 88 IP). They faced him three times between July 20 and August 12 in the midst of their crazy hot streak in July/August, and they lost all three games badly. But the Royals finally got to him last night: 7.1 IP, 8 H, 6 R. Yet somehow he left the game in line for another win due to a suspect managerial move by Ned Yost. With the Royals leading 3-2, Shields got into some trouble in the 6th. Fuld led off with a single and Donaldson walked. Two on, no outs. Shields had thrown 88 pitches, and has cruised through the previous 5 innings with the only blip being Moss’s HR in the first. In a regular season game, your ace pitcher would have the opportunity to work out of it himself. But in a winner-take-all game, Yost opted to pull Shields for – not Kelvin Herrera or Wade Davis, not Jason Frasor or Brandon Finnegan, not even lefty Danny Duffy – but young rookie starter Yordano Ventura. I get the move. I do. And if it had worked, we’d all be talking about what a genius Ned was to bring in the young flamethrower. Unfortunately, Moss took a 97 mph fastball over the centerfield fence. They would add two more runs in the frame and make it 7-3, bad guys. At which point, I gave up. The game was over and Ned Yost was going to get raked over the coals for it. Hope was nowhere to be found, and for the second time, the life had been sucked out of Kauffman Stadium. You could here every word coming from the mouth of every A’s fan. 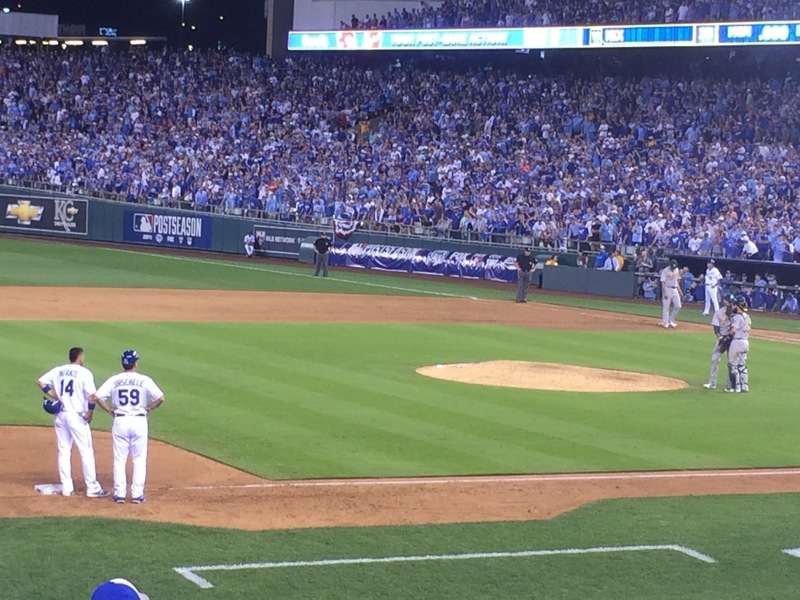 Royals fans could do nothing but watch their season slip away. The song “Don’t Stop Believing” came on between innings, and it was almost comical how depressing things felt. The only ones singing along in my section were two over-served gentlemen down near the front, and two boys in the seats right in front of us. Someone said something about things looking grim, to which one of the kids responded, “All we need to do is have everyone hit a home run and we’ll win.” The kid clearly didn’t know his 2014 Royals statistics, because no one hits home runs on this team, but he taught me a little about hope in the midst of despair. It was the 8th inning when the rally began. Alcides Escobar singled and stole second. Cain singled him home. Cain stole second. Hosmer walked and the A’s pulled Lester for Luke Gregorson. Billy Butler singled and scored Cain, and moved Hosmer to third. Terrance Gore ran for Butler and stole second. A wild pitch by Gregorson advanced both runners. Hosmer’s run made it 7-6. Alex Gordon walked and stole second. 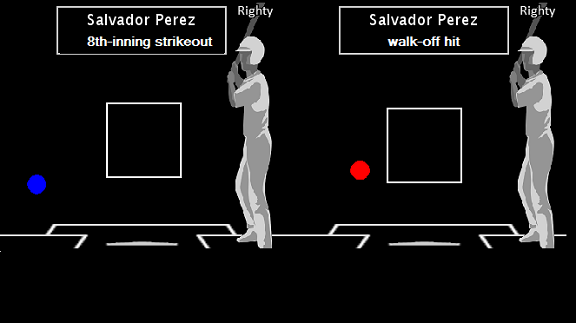 Perez and Omar Infante struck out with the tying run and fastest guy in the league just 90 feet away. The Royals had 7 steals in this game, by the way, tying a postseason record. The biggest of them all game in the 9th. Josh Willingham led off with a single and Jarrod Dyson pinch ran for him. Escobar bunted him to second. Then with Aoki batting, Dyson stole third – the biggest steal of the seven – we were 90 feet away. Aoki hit a sacrifice fly to right and Dyson scored to tie the game and send it to extra innings. The “90 feet away” motif suddenly became a thing as the Royals put a man on third base in 4 consecutive innings – 8th, 9th, 10th & 11th – plating only Dyson. …none of them scored. The Royals did a masterful job doing 3/4 of the manufacturing, but couldn’t get the guy to advance the last 90 feet on three different occasions. Meanwhile, while the offense is stranding runners at third, the bullpen was doing it’s thing. Wade Davis pitched a scoreless 8th. Greg Holland pitched a scoreless 9th. And 21-year old rookie Brandon Finnegan threw 2.1 innings striking out 3. Gosh, he looks good. Finny was playing ball at TCU in the College World Series just 4 months ago, he was the Royals top draft pick this year and has been stellar out of the bullpen since the rosters expanded in September. He ka another reason the future is bright beyond 2014 in Kansas City. Then in the 12th, the A’s did what we couldn’t: they moved a base runner 90 more feet. The runner was Josh Reddick, who walked to lead off the inning. Jed Lowrie bunted him to second and Jason Frasor came into the game and promptly threw a wild pitch. 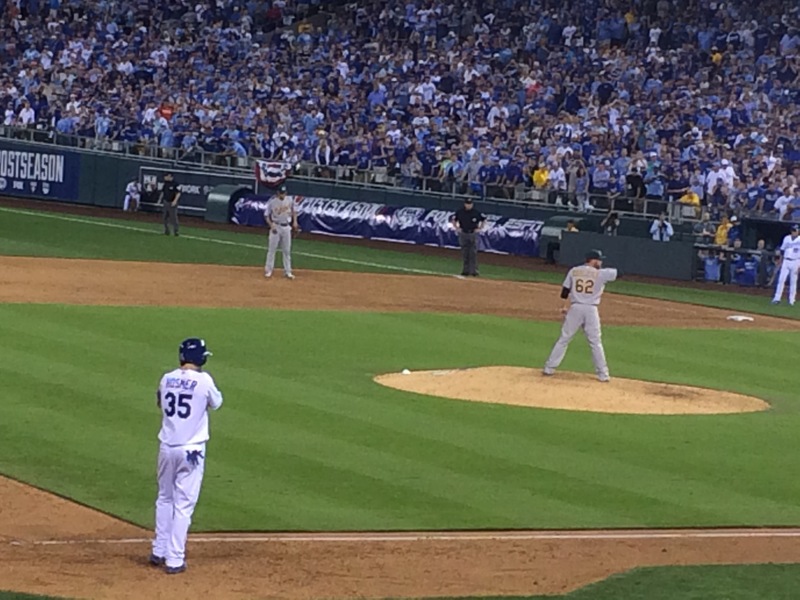 With Reddick at third – 90 feet away – former Royal, Alberto Callaspo, singled to make it 8-7. This was the worst of the worsts for fans at The K. Inning after inning we had runs sitting right there and couldn’t bring them across. And to see Oakland succeed on it’s first try was really frustrating and positively deflating. But the bottom of the 12th is history. Hosmer’s big triple, Colon’s infield single and steal, and Perez’s grounder down the line, and the Royals came from behind for the third time in the same game to defeat the Athletics 9-8. And Kauffman Stadium launched into euphoria. I high fived so many strangers my hand started hurting. I screamed and screamed and screamed. I ripped a set of blue beads I was wearing around my neck and chucked them 100 feet in the air and I have no idea what came of them. On a night that I fully expected to be heartbroken, I was. Three times, in fact. But the joy in the end is all that matters. It was chaos. Bring on the Angels. I don’t care how good they are or how impressive their lineup is or how many games the won in the regular season. None of those things matter in the playoffs. But they have Mike Trout! And Albert Pujols! And Josh Hamilton! And…shut it. None of that matters. What does matter in the playoffs? Pitching, defense and speed. And the Royals have all of those things. I can tell you one thing: no one wants to play the Kansas City Royals. Other teams just don’t matchup for a must-win playoff game. We’ve completed phase two of five. Phase one was to make the playoffs. Phase two was to advance to the ALDS. Three more phases to go. 11 more wins is all it takes. See you at The K on Sunday. Previous Previous post: The Royals are 87-72. Get ready to embrace a brand new narrative.